The Shaheed Minar monument in Dhaka, Bangladesh commemorates the lives lost during the Bengali Language Movement prior to Bangladeshi independence. 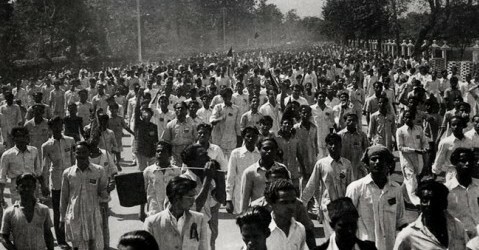 This is the 1st article of a series describing significant events in the history of Bangladesh — briefly highlighting the buildup to, and the effects of, these fateful days. The second article on Shadhinota Dibosh here, and the third on Bijoy Dibosh here. The 21st of February is known internationally as International Mother Language Day, chosen because of the tragic — yet catalyzing— events that transpired on that day in 1952, in Bangladesh. The following is a very brief exploration of the Bengali Language Movement, the fight for linguistic and cultural rights, and the meaning behind Ekushey (21st) February. Bangladesh has gone through drastic changes in its short history. 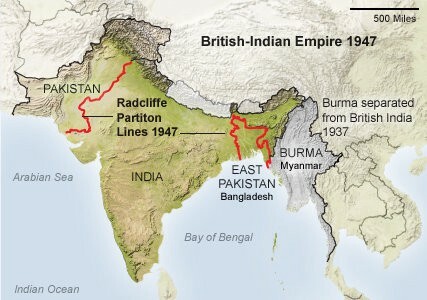 From 1858 to 1947, it was a part of the British Raj under brutal and exploitative British colonial rule. Decades of anti-colonial build-up led to the creation of the Mountbatten Plan, where the British decided to split colonial India into 2 independent states — the division being determined by religion. The Partition of 1947 resulted in the creation of the Union of India and the Dominion of Pakistan — a splitting of Hindus and Muslims. The Dominion incorporated newly established West (present-day Pakistan) and East (present-day Bangladesh) Pakistan. East and West were lumped together as a single country, ignoring the 1600km and the differences in culture, ethnicity, customs — and language — between them. The powers that be decided that the Dominion’s political and military establishments were to be set up in West Pakistan. Consequently, most decision makers and personnel in positions of authority came from West Pakistan. At the time of partition, the population of West Pakistan was 25 million, while East Bengal (aka East Pakistan) was 44 million. West Pakistanis predominantly spoke Urdu, while East Bengal spoke mainly Bangla — entirely different languages with completely different scripts. At an education summit in 1947 in Karachi, the West-Pakistani dominated government established that Urdu would be the only language used in media and taught in schools. Furthermore, Bangla was removed from being an approved school subject, and was taken off official currency and stamps. Bengali student leaders, community organizations and politicians protested these language policies consistently for the next 5 years. This gave rise to what has since become known as the Bengali Language Movement — grassroots organizing to fight systemic cultural and linguistic discrimination and oppression. The Governor-General of Pakistan, widely recognized as the Father of West Pakistan, Muhammad Ali Jinnah visited Dhaka during the height of political unrest and sought to squash the Movement. He stated that the promoters of Bangla were seeking to divide Pakistani Muslims, calling them “enemies of Pakistan”. He reiterated that “Urdu, only Urdu” would be the official state language and even repealed previous concessions that had been made by other politicians to appease Movement supporters. West Pakistan’s refusal to recognize Bangla — the language spoken by the majority of the citizens of all of Pakistan — was quickly recognized as part of a broader agenda of cultural and ethnic assimilation. As such, the Language Movement became a proxy for a broader fight for the right to self-determination. The Language Movement came to a head in 1952 when the Pakistani leadership again reiterated that only Urdu would be the official language of Pakistan. This declaration caused uproar in East Bengal and led to the declaration of widespread protests to be held on February 21st by various student groups. In response to this protest call, the Pakistani government prohibited the gathering of more than 3 people. Notwithstanding, students defiantly began gathering on the morning of February 21st at the University of Dhaka and faced-off with armed police who awaited them. Police fired tear gas to ward off students as they attempted to break through police lines and arrested several students. These arrests sparked further protests, with demonstrators gathering at the East Bengal Legislative Assembly seeking to have their voices heard by politicians. During an attempt to storm into the legislature, several student protesters were shot and killed by police. Inevitably, the deaths of these students sparked furor and led to further demonstrations and widespread disorder across the capital over the next few days; adults and working professionals from all walks of life joined the students in protest of Pakistani oppression. A number of additional activists were shot dead — including a 9 year old boy — by police in those following days. Demonstrations continued for weeks, with beatings and political arrests common. 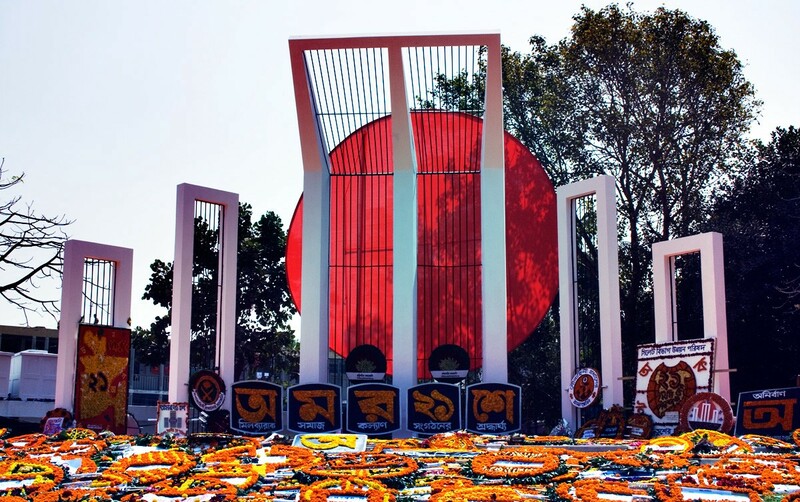 Forever remembered as the language martyrs of February 21st are Abdus Salam, Rafiq Uddin Ahmed, Abul Barkat, Abdul Jabbar, Shafiur Rahman, Ahi Ullah, Abdul Awal, and an unnamed victim. They were honoured with the erection of the Shaheed Minar memorial in Dhaka. 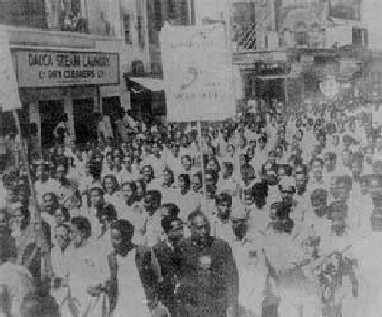 The Bengali Language Movement continued for years after the events of February 21st, 1952. It continued to gain momentum and eventually catalyzed the rise of nationalist movements in East Bengal, leading to the declaration of independence, known as Shadhinota Dibosh on March 26th. The brutal liberation war that followed finally gave rise to a free and independent Bangladesh — declared on Bijoy Dibosh, December 16th 1971. At its roots, the Bengali Language Movement sought to have the linguistic and cultural rights of an entire population recognized and respected. In that same vein and in honour of it, on the 17th of November 1999, the United Nations Educational, Scientific and Cultural Organization (UNESCO) declared February 21st as International Mother Language Day — and was ratified by the UN General Assembly a decade later — “to promote the preservation and protection of all languages used by peoples of the world”. Stories and art on growing up and living Bangladeshi in the West.